Isaac Stern, born in Meppel on the 11th of June 1886, was one of two sons of Samuel Stern, who was an active dancing master in Meppel in the nineteenth century. He married Rijntje de Leeuw, born in Blokzijl on the 5th of October 1882. The couple had two children: Samson Mozes, (born on the 11th of May 1911) and Klara (born on 27th of May 1913). 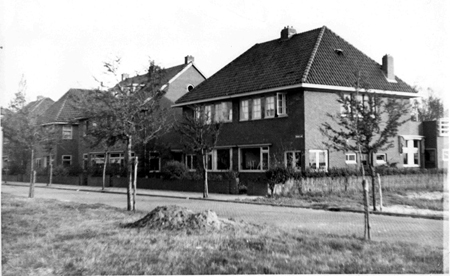 In 1941 Klara was still living at home; Samson (known as Sam) had already left Meppel. It is unknown if Klara was married by then. In any case she was married in 1942, (to Hijman Cohen) but was still living with her parents. Isaac had a theatre/concert hall on the Hoofdstraat (at that time, it was at number 40), which was created by expanding his shop. Unfortunately, a ‘mistake’ was made during the building of this hall. The background of the stage was a wall painting of a bar and a few glasses. It goes without saying that this décor did not suit every play. Later on the ‘mistake’ was corrected. Besides being used as a theatre and a ballroom, it was also regularly used for political meetings, and many prominent politicians from former days held their speeches there. 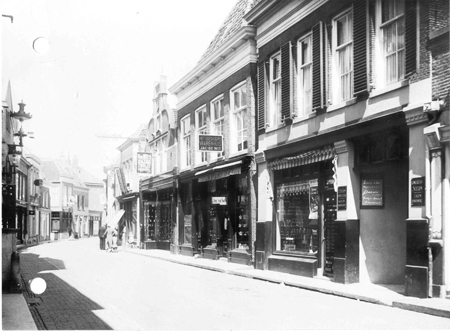 In front of the dance hall, on the street side, Isaac's wife Rijntje ran her porcelain and earthenware shop. 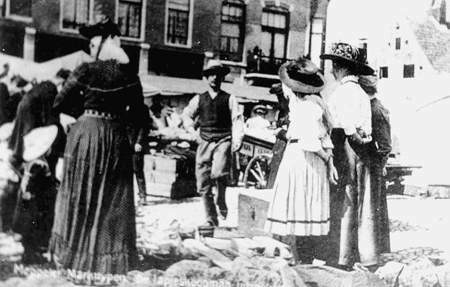 They also had a warehouse on Weteringstraat, where the merchandise for the market was stored. Isaac Stern was not only a dancing teacher, but also a market trader. Besides being a dancing master, Isaac Stern was also a market trader. He was a busy little man, who directed the ball and dancing lessons in a boisterous manner. The ball mostly began with a polonaise, and Isaac did not rest until everyone had joined in. The opening dance, mostly headed by the chairman of the club concerned, created a good atmosphere. Mostly there was ‘live’ music, played by the Meppel duo Engel and Terwal. At the highlight of the party, Isaac climbed on a chair and called: ‘Stern has created a good mood again, hasn’t he?’ It was often so busy on the dance floor that ‘ball roses’ were sold for the price of 25 cents. The cards with a so called clip, was worn by the men in their button holes, and there were, according to how busy it was, two or three colours, for example: red, blue and green. Before every dance, Stern would call out ‘group red’ and so on, and at the end of the evening, after the obligatory polonaise, he would always shout: ‘a little petit encore’ which meant that something extra was coming. Isaac was a virtuoso in playing the flute and would accompany the lessons excellently by playing on a tin flute of 10 cents. When his son Sam was a little older he often accompanied his father on the piano. Sam (who called himself Max) was, like his sister very musical. He often played music for entertainment together with his uncle, the violinist Sam de Leeuw. Both Sam and Klara helped in the business. She would assist her father teaching the youths of Meppel the art of dancing. According to an anecdote, the dancers would wear on one leg a bunch of hay and on the other leg straw. Stern would shout: ‘hay leg, straw leg’, because this was clearer than ‘left leg, right leg’. 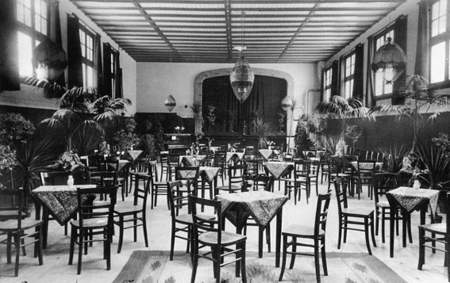 The parties of the Hoofdstraat community club were held in Stern’s hall too. The highlight was without doubt the polonaise, when Max Vile played the violin, walking in front. Isaac Stern’s ballroom in the 1st Hoofdstraat. It is obvious, that a Jewish dance hall was not a thriving business during the German occupation. Isaac understood that quite well. Certainly, when at the beginning of 1941, Regulation 48/41 made it possible that Jewish companies came into the hands of non-Jews, or were liquidated. Isaac saw no other possibility, so on the 1st of May 1941 he went to the Chamber of Commerce, in the Wheem, where he reported the closing of his ‘lunch room and concert hal’. Stern’s dance hall was one of the first businesses in Meppel to close its doors. It must have been very difficult for him; a man who grew up with dancing. As if the Stern family had not suffered enough yet, Omnia officially liquidated the business on the 18th of September 1943. 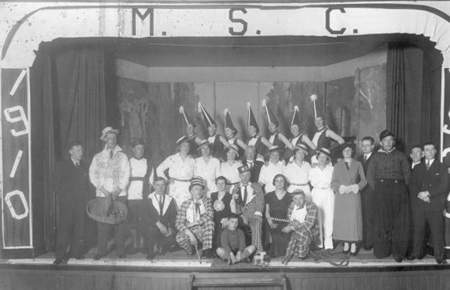 In the MSC-revue ‘Alles komt wel voor mekaar’ (‘Everything will be alright’) of 1935, Jacob Frank (standing third on the left), Klara Stern (sitting, second on the right) and Bennie Levie (sitting, in front) were among the performers. Stern sold the building in the Hoofdstraat to the firm of Ter Braake . He invested the money in a semi-detached house, which was yet to be built on Oranjelaan. The house was designed and built by the architect D. Datema. It cost around fl 12.000,-. They applied for a building permit in January 1941 and on the 1st of April of that same year it was granted. Soon after, the building began. which is kept with the building permit of these houses. The Stern family did not enjoy this house for a long time. 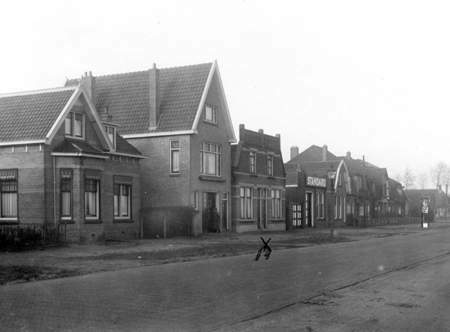 The 31st of July 1942 was to be the last day that Isaac was in Meppel. He was transported to the labour camp in Orvelte and from there to Westerbork on the 3rd of October. There he was reunited with his wife and daughter Klara, but not for long: on the 23rd of October Isaac, Klara and Reintje were taken from Westerbork to Auschwitz to be gassed three days later. At that moment, Isaac and Reintje’s son Samson had already died in Mauthausen on the 1st of September 1942.